You may still be able to book by calling the hotel at 831-649-4511. Known as the “Language Capital of the World,” Monterey is an inherently romantic city thanks to its idyllic location adjacent from the Pacific Ocean and its dreamy nautical style; but don't worry: you don't have to be a polyglot to enjoy this coastal city or the Portola Hotel & Spa at Monterey Bay. Located near 17-Mile Drive, Pebble Beach and Carmel by the Sea, this Monterey, California hotel has a lot going for it. 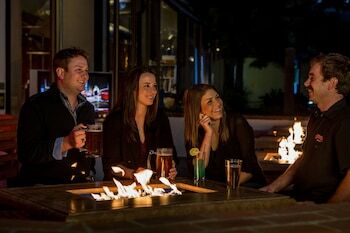 From the Spa on the Plaza, which is the city's number one full-service day spa, to Peter B's Brewpub, which is Monterey's only craft brewery, the Portola Hotel's many features and services put it leaps and bounds ahead of its competitors. After a relaxing day exploring the city, you'll return to one of the 369 guest rooms or 10 suites, where you can take advantage of amenities like sustainable resources, hypoallergenic pillows, 310-thread count linens, 42-inch flatscreen TVs and eco-friendly bath products. 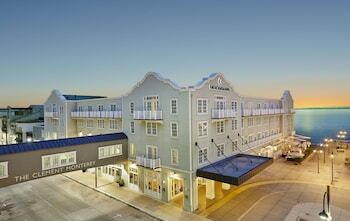 If you really want to kick your vacation up a notch, book a room with a view of the harbor and the Monterey Bay. After all, you didn't travel all the way to the coast to have just any old view. 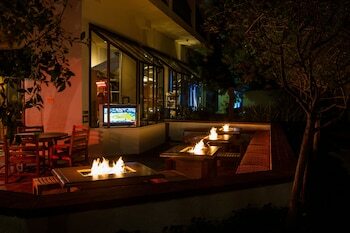 Portola Hotel & Spa at Monterey Bay is a 4-star hotel located at Two Portola Plaza, Monterey, CA 93940, US . Its nightly price usually falls between $161.1 per night and $549 per night, excluding tax, depending on room category. 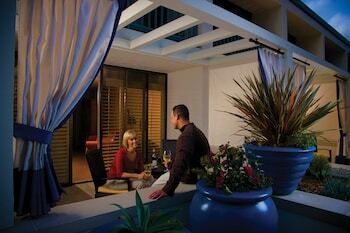 At Portola Hotel & Spa at Monterey Bay, AAA members often get 7-13% off the regular rate. For example, on January 6, 2019, a AAA rate of $161.1 per night was offered. Depending on your itinerary, your savings can be more than the annual AAA membership fee itself! Many Room 77 users are able to pay for their entire AAA membership in a single stay. 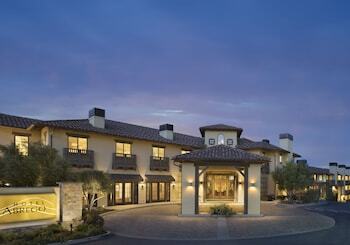 At Portola Hotel & Spa at Monterey Bay, seniors often get 5-10% off the regular rate. For example, on January 6, 2019, a senior rate of $161.1 per night was offered. $161 per night found for a Portola King room type. For January 6, 2019, a special AAA rate of $161.1 per night was found for the AAA - 1 King Bed-342 Sq Ft-Wifi-Mini Fridge room type. For January 6, 2019, a special Senior rate of $161.1 per night was found for the AARP - 1 King Bed-342 Sq Ft-Wifi-Mini Fridge room type. Portola Hotel & Spa at Monterey Bay sells rooms through sites like Room 77, Expedia, Hotels.com, GetARoom, and many others. Room 77 searches across dozens of different sites to find the lowest discount rates available. The lowest rate we've seen over the last few weeks was found on . In 1% of the cases we surveyed, all sites offered the same rate. You can compare real-time rates from all of these sites on Room 77. Room 77 is the only hotel shopping site that includes special discounts like AAA, senior, government, military, and corporate rates.